When I first let people know that I was having a baby, there seemed to be one phrase on everyone’s lips: “Oh, you will have to stop traveling then.” I was usually pretty quick to tell them that this would hardly be the case. Why would a baby stop me from seeing the world? I think the whole point of having children is to show it to them! I believe that more than ever we live in a global community rather than just towns and countries and everywhere we travel to we have something new to learn. Isn’t that what childhood is about? Learning? Although I have every intention of taking my boy around the globe at least once before he starts preschool I had not actually planned on taking him on his first trip at just 5 weeks of age. But when a sailing operator invited all the travelettes to come to Croatia for a one-week sail cruise I didn’t want to miss the chance to finally meet the other girls in the team. They are living all over the world, so half of them I had never actually met face to face. I made a decision: I wasn’t joining the cruise but I would fly out with my little one for a couple of days to meet them. Hands down, I was worried. So worried in fact that 2 weeks before departure I told everyone that I would probably not make it. The what if‘s got the better of me more than once but in the end it all went just fine. My son’s name is Atlas for a reason. Raising a child, and a baby in particular, is one big learning curve and I think I can speak for most first-time moms when I say that a baby comes with all sorts of question marks. I find myself googling baby-related issues every day and when I tried to look up reports and tips on traveling with a small baby I could not find much. One short trip hardly makes me an expert in the field but nonetheless I will give it a go and write down a few things i’ve learned about traveling with an infant. 1. If at all possible travel in the morning or at least at a time that allows you to arrive at your accommodation no later than 5pm. Most babies get more restless towards the end of the day and are in bright spirits in the morning. Bring on the 6am action! 2. Bring a sling. My baby loves our black Moby Wrap as he just sinks into it and falls asleep almost instantly. The world is fascinating for a baby so switching off can be hard. It helps not to see so much (the sling covers most of their heads) and to feel the comfort of mom or dad’s body. Apart from the moby wrap I also brought a Marsupi which gets mixed reviews but is very light weight and easy to put on and take off, even with one hand (unlike the moby wrap). This is what I used to get on and off the plane. During the flight we walked around quite a bit, so it was handy to have something I can quickly put on and off. 3. More is more so bring the pram. I asked various friends about the best solution. Carseat and carrier? Carseat, undercarriage and carrier? Carseat, carrier and pram? I thought about it for a while then decided I’d rather bring too much than too little on our first time. He ended up sleeping for hours and hours in the pram while I enjoyed the town or had lunch with the girls. And on a hot day, carrying baby while walking in the blistering sun is stressful for both of you. Speaking of prams, getting a good one is essential. I was tempted to go for a cheaper model but the hype around the Bugaboo Cameleon is there for a reason. Especially when traveling there are many different kinds of street surfaces and you want a pram that navigates easily and is not too bumpy for baby. 4. Pack smart. Think twice about what you really need to pack to make your and baby’s life easy. Pram? Yes. Carseat? Definitely. Toys? No, not just yet. A small baby needs to eat, sleep and wear clean diapers and clothes. We managed to still only travel with hand luggage, even though I brought my camera and computer with me. A reasonable stash of diapers is important (if you have doubts about finding your preferred kind in the place you’re traveling to). 4. Forget hotels and rent a holiday apartment. You will want the extra room to hang out and cook yourself a nice meal/watch a movie or do some work after baby has gone to sleep. Airbnb has amazing options pretty much everywhere so I was quick to rent a place in Split. Cheaper than a hotel and with more comfort and in this case, a lovely terrace! 5. Get the Soundsleeper App. This is not a joke, people, I swear by this app. The moment I realised that my baby relaxes around washing machines, blow-dryers and showers I downloaded the Soundsleeper app to my phone and have tried all the sounds (from womb to thunderstorm) before realising that ocean does the best. Babies often need help to fall asleep (nursing, rocking, gentle songs) and at least for my son the sound of ocean waves instantly calms him down. This way you bring his sleep routine with you. 6. Adapt the routine. They say it’s hard to establish routines with babies that young but it’s worth trying to have one regardless. My baby goes to bed between 7 and 8 pm and wakes up between 5.30 (ugh) and 7am. He then sleeps again for most of the am with 30-60 minute interruptions and takes random short naps in the afternoon. For me this did mean being home by 7pm and doing what we always do. Daytime sleeps however were confined to the pram or the carrier which worked out just fine. Babies need a good sleep to work through everything they’ve experienced, so this is not something you’ll want to compromise on. Or as I like to call it – happy baby, happy mom! 7. People love babies. 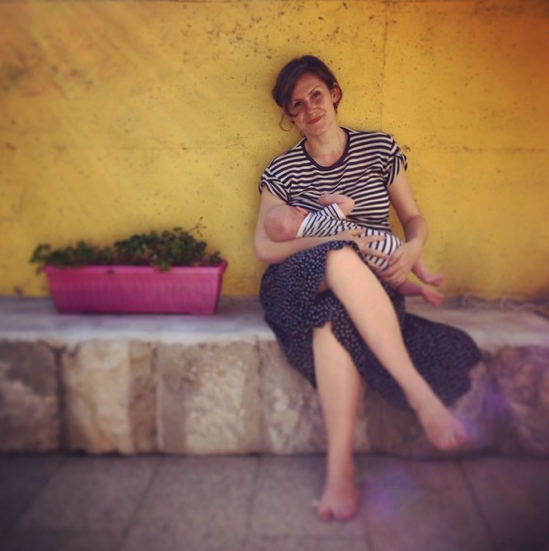 I quickly realised that my worries that a baby would make many aspects of traveling more difficult were mostly unjustified. On the contrary, I often got preferred treatment. We flew Easyjet and no one bat an eyelash when I arrived with a carry-on suitcase and a giant handbag (Easyjet usually only allows one item of hand luggage). People were accommodating on the plane and throughout the trip. A baby is also a great conversation starter when traveling solo! 8. Stay flexible. This is a bit of a no-brainer, a baby always requires flexibility, regardless of where you are. This is not the time to arrive at your holiday destination with a massive to-do-list and you might not want to commit to seeing all 12 of the local museums. Instead just take it easy, stay within walking distance to your accommodation and take each day as it comes. If your baby, like mine, doesn’t like cars, avoid the taxi and go with public transportation. Just try to make your holiday as stress-free as possible, that way you’ll get the most out of it. Finally, do take these tips with a grain of salt. Babies are as different as people and while some of the above mentioned things might work on your little one, others definitely won’t. But as any parent knows, sometimes all you can do is work through the checklist of options to calm a crying baby. I've been discovering all of this recently too -- the expectation that travel wouldn't be possible, and the reality that it really is. My son just turned 9 months old, and he's already gone from Spain, to (and around) the US, Italy and Portugal. It hasn't necessarily been easy, but it's been so rewarding, and very much confirmation that travel is and will be doable with my little guy. In fact, it may even be better! Stolz. Danke für die Tipps. Für mich als Tante schon ab und an eine Herausforderung - aber man kann es machen. Und es auch genießen. Weiter so! 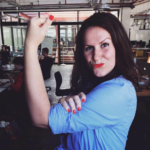 Viel Power und Freude an euch beide! I think people have a wrong idea about baby travelling, especially long flights. I'm here talking about BABYS( 0-6 months) let's say before they are on the move.Then, it is another story. A pretty hectic flight even without a baby... ( Melbourne-Sydney-LA-Mexico-La Havana).... But babies this age need to sleep, no matter what and they can sleep more or less comfortably on yourself or in a bassinet - which is not the case of toddlers or even young children. One important tip: choose a departing time leaving the evening, so your baby will be tired, maybe overtired but at least lights are turned off and people are quiet! To my experience, as soon as the engine turned on he fell asleep for about 7h. Lucky? No. I don't have a good sleeper, just a very young baby. Then, If you travel you need a good pram I totally agree! If you travel, in most cities you need a compact, easy to fold and not too heavy if you're by yourself. If you intend to go to remote places, forget the fancy pram! You need the 4x4 of the pram, especially good tyres. The bugaboo wouldn't have survived to the Havana street. Get something with big wheels like the mountain buggy, with inflatable tyre.... Even if you intend to go to the beach! Child carrier, Definitely! Car seat, a must too.... If can't take your bassinet ( like me in Cuba) the capsule would do the job. However you can't leave your child all day in the position. You have to make sure he/she will lie flat to have some nap, on the beach in the shade. Another tip: don't go travel for too long with people who have no kids and don't intend to have any for the coming 10 years. I love my friends very much and they love my son very much too. Nonetheless, I will not go on a road trip with them and my son as a 20 min the screaming baby is stressful for you but an unbearable moment for those who haven't experienced parenthood as yet! They are not apathetic nor selfish they will just feel helpless. It will stress you out even more. Another hard moment will be at 5:30am when you will wake up and everyone else would be in bed for only 2hours. I completely agree, the day must start early. Jet lag is PAINFUL but... Less painful when you have a baby than a toddler. Count 2 days to get into a routine... Avoiding big jet lag would be one of my biggest advice. Either do a stop over half way for maybe 2 days if you have time, the jet lag at destination will be better. If can't do that, well travel vertically!ahahha From France to South Africa there is no time difference. -they only drink milk, no need to be bothered about food safety, only bottle water or you need to be extra careful if you breastfeed. 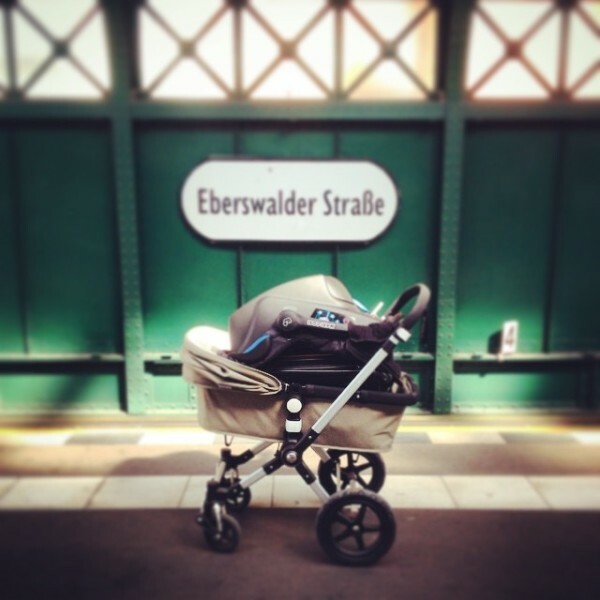 After all : KEEP CALM and travel with your baby! We took our 4 month old to Amsterdam and Paris (we live in the Chicago area). It was SO much fun! I used the Warm Milk Hobo diaper bag that worked as a boppy as well. Especially in the hotel room, it was nice to have a nice comfortable positioned for the evening feedings. 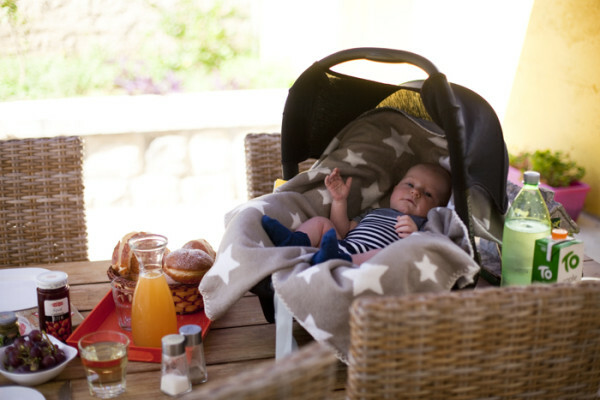 We used our Uppa Baby Vista in the regular seat mode (not the bassinet) since it reclines quite a bit. She did sleep a lot out and about, we got about 6 hours at the overnight time frame. Which is a decent amount if you are a new mom anyway. Sometimes she just slept in our arms, sometimes in the Uppa baby with a thick blanket in the room. We just got a standard hotel room and didn't order a crib or anything- it was fine. We brought all 73 diapers but it was fine because we filled that space with souvenirs on the way back. Traveling with a baby was more tiring, but so much fun, and exhilarating- we walked in the warm sun everywhere and I loved it- it was a refreshing time post-baby to feel like a person again. I must say, it was so much easier to travel when she was a baby... No need to pack any toys, food, preferred books, no ridiculous amount of princesses dresses and shoes, or any sort of entertainment. She was on breast milk until she was 1 year old so we didn't need to pack food, not many clothes... and when we needed something we didn't have, we bought it wherever we were. There are supermarkets everywhere and they are all packed with baby stuff. I must say, starting from when she was so little was crucial for her - now - being able to sit a whole day in the car without complaining a bit about being bored or tired... She loves finding out new stuff even at the service stations, seeing the different things they sell... Anything is of interest for her. She is 7 now and absolutely loves travelling. She has an awareness of the world geography which I doubt many children of her age will have. She loves maps and knowing things about different countries. She is able to communicate in Portuguese (mum's language), German (dad's language), English - since we live in the UK - and in French and Italian, just for visiting France and Italy regularly. She tries her best to communicate with people wherever we go, asking how to say things in the local language, trying to read and associate with the languages she already knows. We went to Poland 2 years ago and she came back speaking so many words in Polish. Went to Hungary and she learned a lot as well. Anywhere we go, she canes back with "added vocabulary"., and of course, knowledge. I doubt that would be possible without all the travelling around. Our eldest daughter is so passionate about travelling as well that she's pursuing a career in the travel industry. We love travelling and have never changed our lifestyle because of our children. I think that it has only benefited them. Travelling, as early as possible, can only benefit children, especially in our present - globalised - time. thank you for this lovely and encouraging comment, beatriz! i am hoping for exactly the same for my boy. Maybe this blog is interesting for you, as it covers many questions about traveling with little ones. Thanks for the tips! Were you able to do a gate check with your Bugaboo--or did you have to do a regular baggage check? I ask because you said you traveled using only carry-on luggage, and I'm wondering if they let you hold on to the Chameleon after airport security? hi cassi, i had to do a regular baggage check, although i did not even try to bring it with me. i have heard that some people bring a carseat with undercarriage and just gate-check the undercarriage though? Oh, from your post (point 3) I understood that you had actually travelled with your Chameleon? Is that not the case? 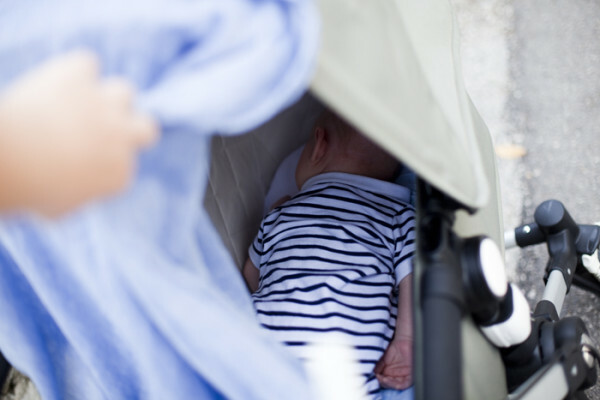 Or do you recommend another pram instead that you used for travel? i DID travel with the cameleon and i do recommend it very much! Thanks for all these tips, maybe I can do it finally!